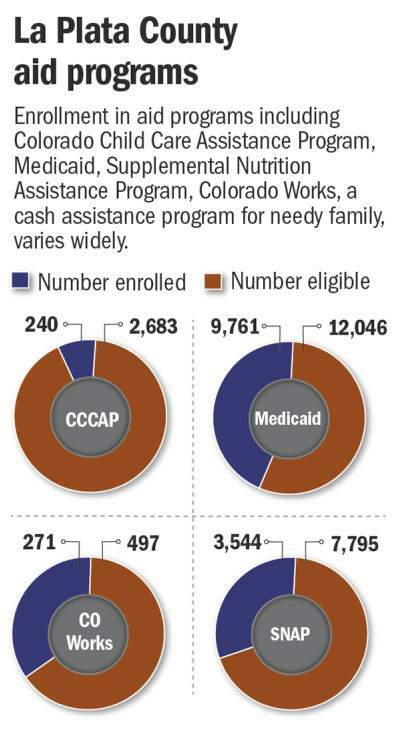 La Plata County has low enrollment in federal aid programs aimed at helping those in need with health care, child care, cash assistance and food needs. Federal and state aid programs aimed at meeting the needs of the poorest residents in La Plata County are not reaching many of those who are eligible. Enrollment varies widely across federal- and state-funded programs designed to provide child care, food assistance, cash benefits and health care needs in La Plata County, according to a recent analysis by the Colorado Center on Law and Policy and Hunger Free Colorado. The online Gap Map shows disparities between enrollment and eligibility; it is meant to spark conversations about how to manage county spending. La Plata County is ranked among the worst counties in Colorado for program access, according to data based mostly on average caseload numbers from 2014 to 2016. The analysis focused on the largest basic human services provided, such as Medicaid, Colorado Child Care Assistance Program, Supplement Nutrition Assistance Program (or SNAP, formerly known as food stamps), and Colorado Works (formerly known as welfare). Child careIn La Plata County, enrollment in the state’s child care assistance program is 9 percent – the lowest enrollment rate among all the programs in the county. The program provides child care assistance to families with children younger than 13 and has low enrollment statewide, said Martha Johnson, director of the La Plata County Department of Human Services. She expects bills from the Colorado Legislature will help revamp the program and add funding for child care, she said. “It is something that is a priority at the state level,” she said. The program can help parents start working or advance their employment and perhaps end their need for financial assistance, Johnson said. Low-income families can spend 40 percent of their paychecks on child care. The benefit helps offset those costs – although some families may still owe a co-pay for services, said Heather Hawk, executive director of the Early Childhood Council of La Plata County. “It’s definitely essential for keeping young families in our community,” she said. Low enrollment is partly the result of other options for subsidized child care in the area, including Head Start, Native American Head Start and Colorado Preschool Program, which is offered through Durango School District 9-R, Hawk said. There are also long wait lists for child care in La Plata County, and if someone is eligible for CCCAP and signs up for the benefit but cannot find care, that person is not counted as enrolled, she said. However, the program is well-known among child care providers, and the county has an above-average number of programs that can accept CCCAP payments, which are below market rates, she said. Food assistanceCountywide enrollment in SNAP is about 45 percent. Enrollment in the program tends to lag behind Medicaid statewide. “As a state, we have not done a great job of ensuring everyone who would benefit from food assistance is getting it,” said Michelle Webster, manager of research and policy analysis with the law and policy center. The need to increase the enrollment in SNAP was recently identified in a five-year plan to end hunger in the state, which could help bring focus to the issue, Johnson said. The budget crunch in La Plata County has made it hard to staff SNAP at the level needed, and that can lead to longer wait times for those signing up, she said. Enrollment in SNAP can help young children in the long term by reducing their rates of obesity, high blood pressure, heart disease and diabetes later in life, according to the Center on Budget and Policy Priorities, a nonpartisan research and policy institute. Cash benefitsColorado Works, a temporary cash-benefit program for families, is disbursed to 54 percent of those eligible in the county. While enrollment is lower compared to other counties, La Plata County staff far outpaces others when it comes to efficiently disbursing payments. La Plata County disburses $8.42 in aid to clients for every $1 spent on administration, the best ratio of any county in the state. This is partly because the county has an experienced staff and it eliminated all but one of its contracts for outside services, such as employment training and coaching, Johnson said. The elimination of the additional services can make it more challenging for those receiving Colorado Works benefits to achieve self-sufficiency, Johnson said. Health careMedicaid enrollment is 80 percent of eligible residents in La Plata County and far outpaces other programs, which aligns with trends statewide. The rollout of the Affordable Care Act in 2014 helped boost enrollment. “That increased publicity, and getting the word out really led to a lot of those numbers going up,” said Amy Downs, vice president of the Colorado Health Institute. 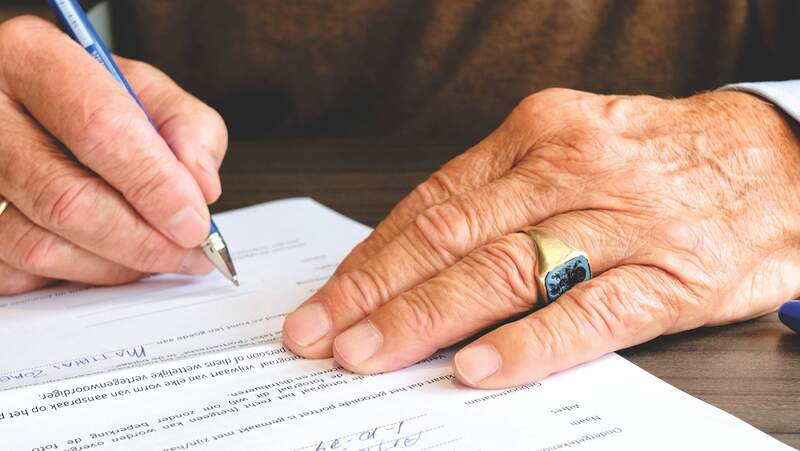 Colorado chose to increase its income eligibility requirements for Medicaid as part of the change, but many of the new enrollees would have qualified for the benefits prior to expansion, she said. Those enrolled in Medicaid are more likely to get health screenings that help detect chronic illness and other services that are tied to improved health, she said. “Medicaid coverage does lead to certain changes that we know are associated with improved health,” she said. To see the latest data on human service program access from the Colorado Center on Law and Policy and Hunger Free Colorado, go to gapmap.org.